Thanks to TJ Green Associates! "Hermetic" is a word that is often misused. People who think any "airtight" seal is hermetic are misinformed. Sure, that Ziplock bag protects your ham and cheese sandwich from drying out till lunch, but is it hermetic? No way, Jose! Search Alibaba for the keyword "hermetic" and you will see this term misused time and time again. What is hermeticity? The dictionary definition of the term “hermetic” means a seal that is gas tight or impervious to gas flow. In the context of a hermetically sealed microwave module it implies an airtight seal that will keep moisture and other harmful gases from penetrating the sealed package. Of course it also means that it keeps hydrogen and other gases from escaping, which is a horse of a different color and discussed elsewhere (soon to be a separate Microwaves101 page!) Metals, ceramics and glasses are the materials used to form the hermetic seal and prevent water vapor from accumulating inside the package. A properly made hermetic seal with a sufficiently low leak rate can keep a package dry and moisture free for many years. MIL-STD-883 Test Method 1014 is the universally accepted test designed to determine the effectiveness or hermeticity of the seal. There are other mil specs out there such as MIL-STD-202, but they are basically just cut-and-paste copies of MIL-STD-883 TM 1014, the de facto standard. Per the MIL specs, epoxies or other polymeric materials cannot be used to create or improve a hermetic seal; moisture will eventually penetrate through the epoxy seal and into the package. Some polymeric materials are better than others in terms of moisture permeability, and an epoxy-sealed package may pass leak test. However, in time all epoxies will allow moisture into the cavity. On the other hand, nothing is completely hermetic. The decision to hermetically seal depends on the sensitivity of the components to moisture and other harmful gases, customer requirements/specifications and the end-use environment. It turns out many all-gold metalized MMICs are generally robust to moisture related failures. 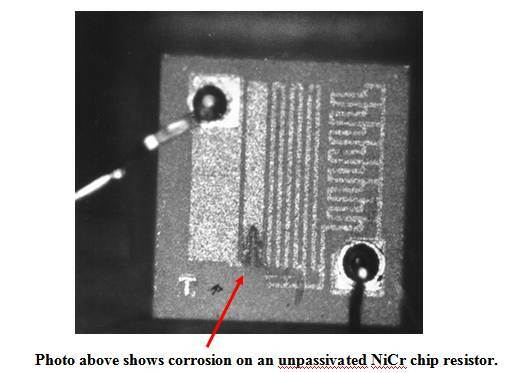 If liquid droplets form on the surface of an IC or a thin film precision resistor, then corrosion or other electrochemical reactions may degrade the performance of the device and lead to failure. Moisture droplets can form as the package is cooled below the dew point. This surface water then combines with ionic contamination, and along with a bias will corrode exposed metal and lead to an open as shown below. This type of failure mechanism scared the bejesus out of the US military establishment in the early 1970s and created to this day an overwhelming fear of hermeticity failures in critical DoD systems. The theory is to keep the moisture content within the package sufficiently low enough to avoid condensation of water droplets onto the active semiconductor devices. The intended temp range for most military systems is -55 to 125 C. The red headed step child of TM 1014 Seal is TM 1018 RGA (Residual Gas Analysis), which requires moisture content to be below 5000 PPM. This is a number below which dew formation inside the package is no longer a concern. Described here are two methods to create a hermetic seal. Other materials and processes are also used including a variety of solder sealing techniques and projection welding is very common for TO cans. Seam sealing is a process whereby the metal platings on the package and lid are melted and a hermetic joint is formed. The sealing is done in a chamber that usually contains 100% nitrogen or a nitrogen/helium mix and is dried out to a very low (below 5000 PPM) moisture level. In a seam sealing process rollers contact the lid and a current is passed through the lid to package interface, where the high resistance creates heat and locally reflows the plating materials (usually gold or nickel). The packages and lids often made from Kovar (a trade name for an iron-nickel-cobalt alloy), but other materials can be used provided resistance high enough to generate sufficient heat to melt the platings. Thinking about seam sealing an aluminum housing? Try again, it’s too good at conducting heat. 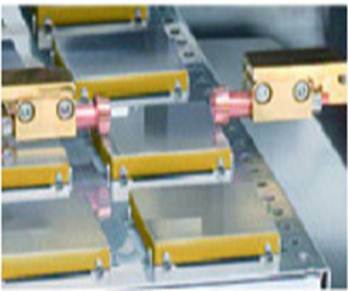 Laser welding is another hermetic seal process that is commonly used for sealing RF and microwave modules. In this process a high powered (i.e. 400 Watt) Nd:YAG laser impinges on the top cover and simultaneously melts the lid and package, which results in a true weld. The package is often made from an aluminum 6061 alloy and the lid from Al 4047. Laser welds are generally stronger than seam sealed lids. 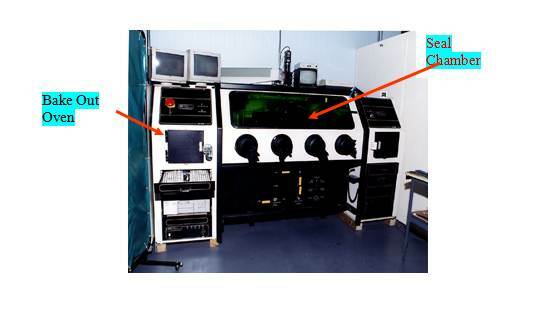 Below is a photo of a laser welding setup. There are several techniques for doing this, but the most common method is to measure the rate at which helium escapes from a package that has been “bombed” or backfilled with helium (the tracer gas). The measured helium leak rate known as R1 is then correlated with an equivalent "air" leak rate. This is where people start to scratch their collective heads. 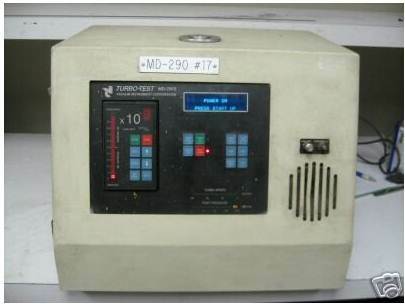 R1 is what is measured at the leak detector….it’s the dial reading or digital readout displayed on the machine. But this is not the true helium leak rate. However, it is related to the spec through a complex equation known as the Howl and Mann equation. Once you see this equation you’ll wonder Howl and the Mann did they ever come up with this. But lucky for you there is an easy to use Excel spreadsheet that one can use to plug in the L (air leak rate spec based on a given package volume) and a few other variables and then compute the equivalent R1. That makes life easy because now you can compare the calculated R1 value with the measured value and determine Pass of Fail. Hermeticity is checked with two tests, gross leak and fine leak. Gross leak dips a module into a liquid and looks for bubbles. Fine leak is the "helium bomb" test. Why not just use the fine leak test and skip the gross leak test? If you had a module with a giant hole in it (a gross leak), the helium that is bombed in would all leak out and fly away before the sniffer could detect any! Here's a helium leak tester that was for sale on Ebay recently for ~$1000, thanks to the recession. Jeff pointed out that there is a conflicting requirements in MIL-STD-750. However, this is usually not applied to microwave modules. 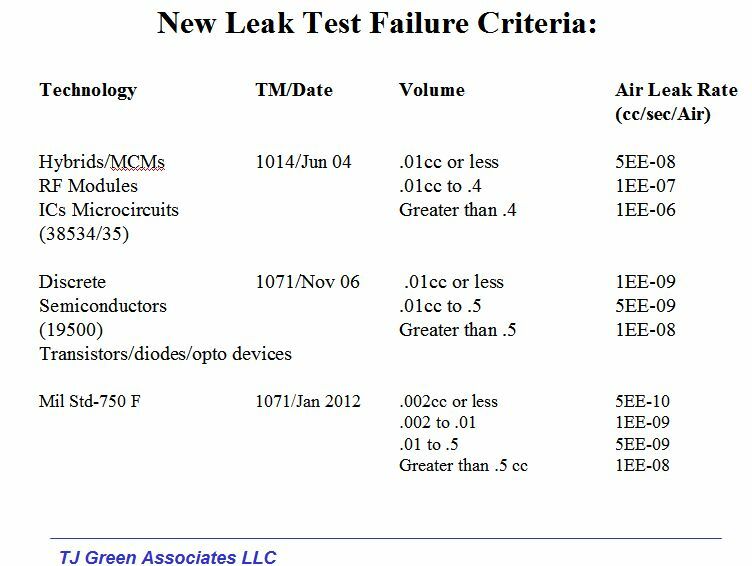 This has caused quite a stir within JEDEC and now requires new technology to measure leak rates according to the new standard. But how much of the microwave community is really affected by this? Most 750 suppliers have switched to Kr-85 leak testing and maybe charge a little more because of it. It is doubtful that a tighter spec change in TM 1014 will take hold anytime soon - certainly not by two orders of magnitude. “Near-hermetic”…what the heck is that? When the term “near hermetic” or “non-hermetic” packaging is used it implies the package is made from polymeric materials as opposed to glasses, metals and ceramics. Other terms can be substituted like “quasi-hermetic”, “almost-hermetic”, “not quite-hermetic”, but they all have one thing in common… they are made from plastics (e.g. liquid crystal polymer, or LCP). Naturally, plastics reduce cost, weight, size and if designed, manufactured and tested properly hold the promise of a reliable substitute for a hermetic can. 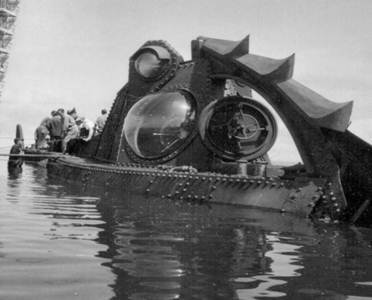 A near-hermetic package simply put is not hermetic as defined by the military specs. With plastics you now have to concern yourself with moisture diffusing through the sidewalls and the standard MIL-STD-883 TM 1014 testing no longer is an adequate screen test. Other tests for checking and predicting moisture build up inside the package need to be developed. But many microwave companies are actively pursuing this technology because it offers the potential for greatly reduced cost and may just be good enough for the intended application.